We start our summer family trip to Thailand with two nights in Bangkok. We fly there from London overnight, and take a taxi from the airport to our hotel, the five-star Amari Watergate. 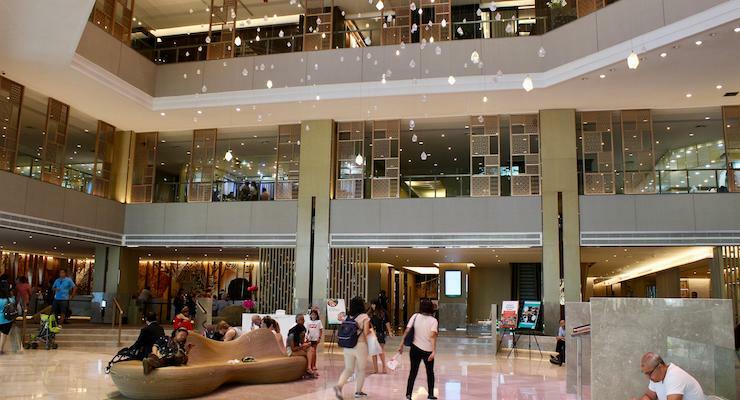 It’s 30 degrees and I’m feeling somewhat jaded from the 12-hour flight when we arrive at the Amari, but as soon as I step inside the soaring air-conditioned lobby I feel better. 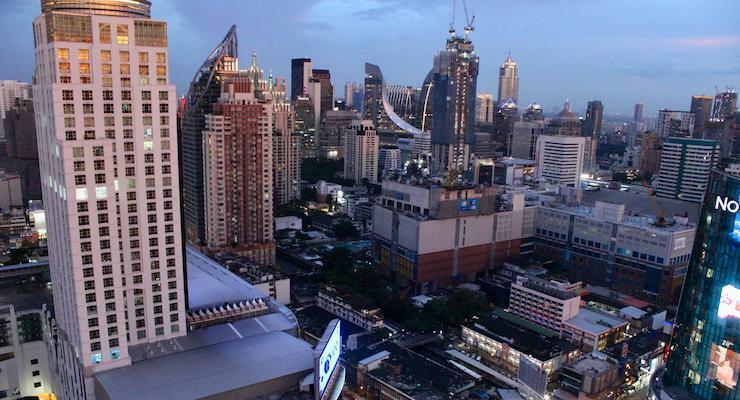 The Amari Watergate is in the Thai capital’s vibrant Pratunam shopping district, and is a modern, luxurious hotel. The lobby is vast and airy, and a striking lighting installation made of 847 pieces of Murano glass is suspended from the ceiling. Apparently the number 847 is because that is the hotel’s address, and the work represents a waterfall because there used to be an actual watergate nearby (the name Pratunam means watergate). From the main reception desk in the lobby we’re whisked up to the smart executive lounge on the 32nd floor to check in. We’re given iced water and cold towels to refresh ourselves with while we relax on comfortable sofas and wait for our details to be processed. Much to my 15 year-old’s relief, we learn that there’s free, fast wifi available throughout the hotel for guests. There are 569 rooms at the hotel. We have two rooms on the same corridor on the 23rd floor – a double for me and my husband and a twin for our kids (age 15 and 20). Our rooms are spacious, welcoming and well-equipped and I feel at home right away. There’s a generous fruit plate to welcome us, containing some familiar favourites as well as some fruits which I’ve never seen before. There’s tea and coffee making stuff, a mini bar, a sofa, a desk, a safe, and a big, marble bathroom. Soft cotton waffle robes and slippers are provided for guests. The air-conditioning (a necessity in sweltering Bangkok) is individually controlled, so you can adjust it to your preference. It’s good to see that our room has several power sockets, including some which work for our UK plugs, without the need for a converter. A very useful feature, which I discover at night, is a dim light below the wash basins so that you can see your way to the loo in the dark without having to turn on an overhead light. Our bed is extremely comfortable and I sleep well here. Some of the rooms in the hotel, including ours, come with access to the executive lounge, where we checked in. As it’s on the 32nd floor and has high ceilings and huge windows, the executive lounge has panoramic views across the city skyline. It’s open all day and serves complimentary soft drinks, tea, coffee and snacks. In the afternoons it offers afternoon tea and each evening complimentary alcoholic drinks and light food are served. The staff here are extremely helpful and friendly – they called British Airways lost property at Bangkok Airport when I realised that I’d left my Kindle on the plane, and they also printed our boarding passes for our flight from Bangkok. Apart from when we were asleep, we probably spent more time here than anywhere else in the hotel. On our first evening in Bangkok we’d planned to go out to eat, but it was raining, we were very tired and we needed an early night, so we ended up just spending a relaxing couple of hours here, snacking, drinking cocktails (mocktails for our son) and watching the sunset. On the eighth floor the hotel has a range of facilities for guests to use. There’s a decent sized outdoor swimming pool with a jacuzzi, a children’s pool, and a deck with sun loungers and a bar area. There’s an impressive fitness centre with a spacious gym, a yoga room, squash courts, saunas and steam rooms. There’s a roof garden with benches and a grassy area which would be a good place for young children to let off steam. 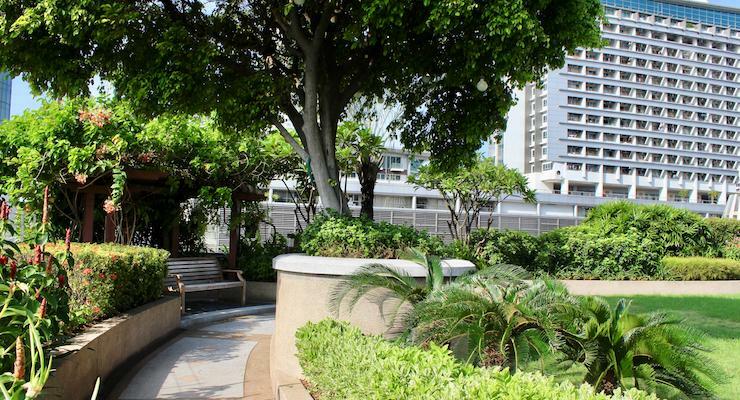 It feels great to have these fitness and relaxing outdoor spaces in the heart of the city. There’s also a spa which offers massage treatments. Downstairs, the lobby has cosy areas with sofas and armchairs where guests can hang out and relax. We have two options for breakfast (included in the room rate) – a limited range in the executive lounge, or more choice in the vast Amaya Food Gallery on the fourth floor. We opt for the latter, and the range on offer is amazing. It feels like a whole world of breakfast. 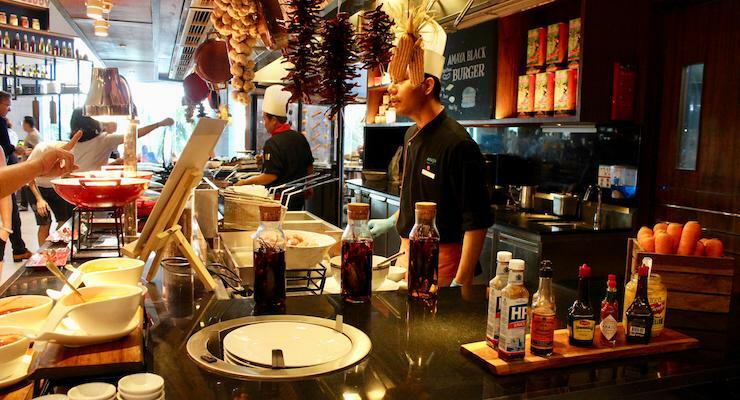 There’s everything from Thai, Japanese and Malaysian dishes to eggs and bacon, cereal, pastries, fruit and toast. My body feels like it’s 3am (there’s a six-hour time difference between London and Bangkok) so I’m not sure what I want to eat, but on the first morning I go for fresh fruit, guava juice and some vegetable red Thai curry with rice. It’s all delicious and sets me up well for the day. On the second morning we’re there briefly at 5am before an early flight, and I just have fruit juice as my body clock is still very confused and I’m not at all hungry. We have dinner in the restaurant at the side of the Amaya Food Gallery on our second (and last) evening at the hotel. There’s a Thai menu and I check first that they have vegetarian and vegan options for me and my daughter. She and I have stir-fried vegetables, my husband chooses beef green curry, and our son opts for duck red curry (this is to be his favourite dish throughout our trip, and he orders it whenever it’s offered). For dessert my son and I choose mango sticky rice, as we’ve heard that it’s a popular Thai dish. The food is good and it costs about £60 for the four of us. 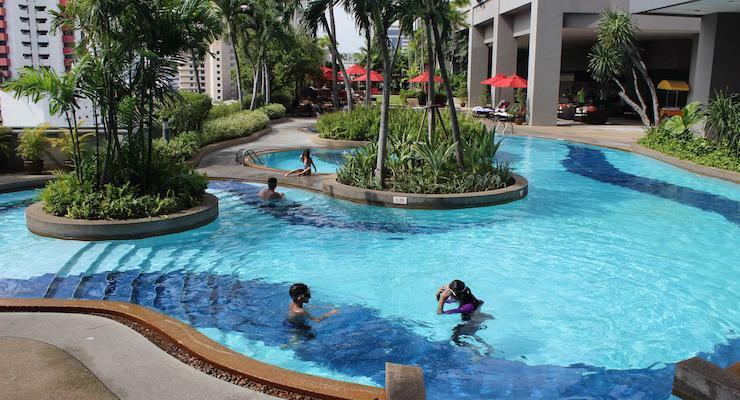 The hotel’s other dining options are the Pool Bar, which serves drinks and snacks by the outdoor pool, and Cascade bistro which serves light snacks and drinks. Our first expedition after arriving at the hotel, once we’ve showered and changed, is to the nearby Platinum Mall. Platinum Mall is an enormous and fabulous indoor garment wholesale market and I enjoy exploring it. It’s an authentic Thai place to shop and offers a good chance to bargain with stallholders (although we do this very half-heartedly, as everything seems pretty good value to start with). My daughter and I each buy some light cotton trousers to wear when visiting temples (legs have to be covered if you go into a temple in Thailand – if you’re wearing shorts you’re not allowed in). Later on we go to see one of the other nearby malls, but we don’t spend long there as it’s full of designer shops and it feels like you could be anywhere in the world. It’s more interesting exploring outside the mall, where we stroll around and find a shrine to Ganesha, busy with devotees leaving offerings to the elephant-headed god, a street food market packed with diners, and a crowded ferry stop on the river. The next day, our only full day in the city, we devote to seeing some of the historic sights there. We use public transport to travel around, and find it to be very efficent, clean and cheap. There’s a BTS (Sky Train) stop just a few minutes’ walk from the hotel. We take a train to Saphan Taksin and then a boat to the Old City. We go to the magnificent Grand Palace, once the Royal residence, see the Temple of the Emerald Buddha and then walk to Wat Pho, the Temple of the Reclining Buddha. It’s all amazing and beautiful and I wish we had more time to explore the city. I hope to return to Bangkok in order to do that. 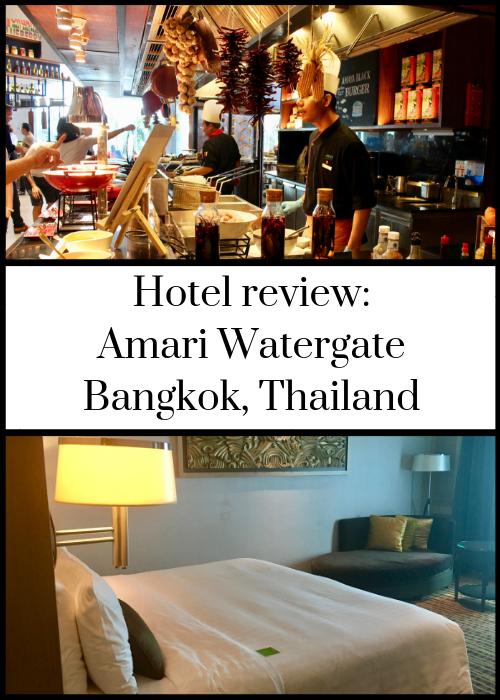 I really enjoyed staying at the Amari Watergate and I’d definitely stay here again. The location is great and the hotel offered everything that we needed for a relaxing trip. The executive lounge, the outdoor pool and the roof garden make this an outstanding place to stay. 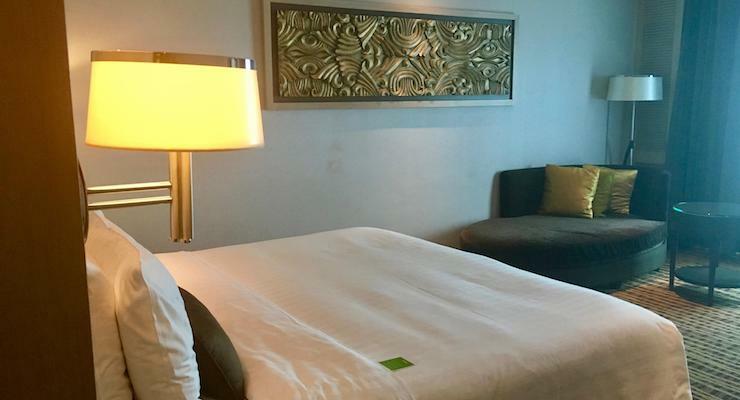 Prices at Amari Watergate Bangkok start from THB 3,800 (approximately GBP 84) in the low season and from THB 4,400 (approximately GBP 98) in the high season per night for a Deluxe room, based on two sharing, including breakfast. From Bangkok we travelled to Elephant Hills luxury tented jungle camp in the South of the country. You can read about it in my posts What’s it like to stay at Elephant Hills, Thailand? and Elephant Hills Thailand adventure review and What to pack for Elephant Hills. From Elephant Hills we travelled by road and ferry to The Tongsai Bay, a five-star luxury resort on the island of Koh Samui. You can read about it in my post Hotel review: The Tongsai Bay, Koh Samui, Thailand. While we were there we took part in a brilliant Thai cooking class. I’ve also written a post about the activities at the resort: Things to do at The Tongsai Bay, Thailand. From Koh Samui we flew to Bangkok, and we spent the last night of our trip at the Novotel at Bangkok Suvarnabhumi Airport before our flight back to London. *Disclosure: This post contains affiliate links, which means that if you click through and book I may receive a small commission. We were hosted at the Amari Watergate for two nights on a B&B basis for the purposes of this review. We paid for our own transport, meals (apart from breakfast), excursions and other expenses. All opinions, words, images and video are my own and are completely independent, as ever. Mmmm yum – I like the sound of thai red curry for breakfast! Our family is with your son in warming (or otherwise) to a place based on the quality of its breakfasts. The ones here sound difficult to beat. Yes, the breakfasts were impressive! That sounds like just what you need after a long flight in somewhere as busy as Bangkok – I loved my visit to the city years ago but a calm cool oasis (with cocktails!) makes a big difference. The price seems very reasonable too. Yes, we really enjoyed staying there – and the cocktails were delicious! What an amazing looking hotel and that’s a good price. I love the sound of the breakfast, hotel breakfasts are one of my favourite things in life, especially ones that serve savoury food like curries, for me that’s the perfect start to the day. The Executive lounge sounds like a very nice treat too. I am desperate to get back to Thailand and take the kids, I think they would love it. Hotel breakfasts are the best – and this one truly seems to have every option!